Last year I was riding the fi’zi:k Arione saddle during the race season. I found it to be fairly heavy and not as comfortable, so this year I was hesitant when I was given the fi’zi:k Antares R1 Braided saddle to race on. Half way through the season and some 3,200 miles later, I have been very happy with the saddle and my pessimistic expectations have been proven wrong. I am fortunate to have the carbon rails and carbon shell which brings this saddle down to about 150 g so the weight is not a factor to worry about. In fact it is one of the lightest saddles on the market today so clearly fi’zi:k have been listening to their customers and responding. Unlike the Arione, the Antares has a much more defined shape and in no way could be considered lazy. I find I had to spend more time to find the ideal saddle position on my bike fit to ensure I was in the comfort zone on this saddle. The padding is not that thick on the saddle and is very firm. For each their own, but in a crit heavy racing season, this is exactly what I like to have. On 100 mile plus training rides is the only time I wish the saddle was more forgiving. But this was usually accompanied with a lot of sitting up position riding. In longer road races, I did not experience the same discomfort due to the composite shell and wing flex technology. The fi’zi:k Antares R1 Braided is a fantastic saddle. 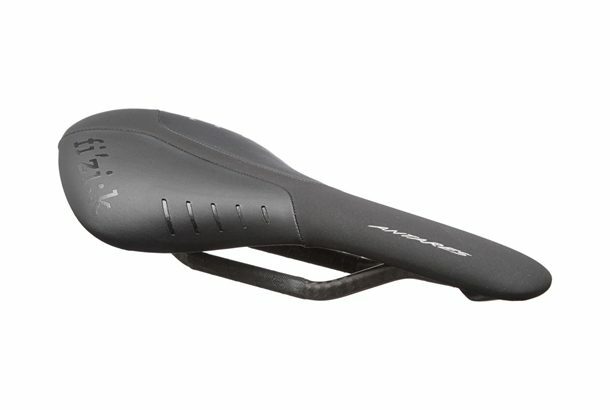 If you are selecting a saddle for performance and weight, then this saddle is for you. It is very versatile and ideal for all road racing distances and fast criterium racing. More information on the Antares R1 Braided saddle can be found on the fi’zi:k web site.